Jack Laister talks about his first gliding experience: building and flying a primary. Twelve years later, his adventures with the primary led directly to his design for the rear-loading Trojan horse. During World War II, as the Allies made plans to invade Japan, Jack Laister designed the CG-10, a glider slightly larger than the B-17. Nicknamed the Trojan Horse, the CG-10 was the first rear-loading aircraft, a concept born of a boyhood run-in with cattails. Already an avid-model-plane builder, as a ninth-grader at Roosevelt High School in Wyandotte, MI, he built a full-size primary glider designed by Claire Jones, his manual arts teacher. "It was like sitting on a two-by-four," says Laister, at age 91. "I'd take off from a knoll. But when I landed in a creek bottom, cattails would scratch my face. That's how I got the idea for the Trojan Horse to be rear-loading. If you damage the nose of a big, front-loading glider, you can't unload its cargo." In the 11th grade, Laister decided to build a glider of his own design. Construction of the wing-section ribs began in the bedroom and basement of his classmate Kenneth Thomas. But when Thomas' mother grew tired of all the sawdust, the project moved to a two-car garage owned by Laister's brother Charles. Two moves later, work was completed in the four-carriage garage owned by the father of Laister's classmate Neil "Salty" Rolfson, the future commodore of the U.S. Steel Fleet. The fabric for the glider had been sewn by 16-year-old Helen Yops on her mother's Singer sewing machine. The glider had its maiden flight on Thanksgiving Day 1932 at Wayne County Airport (now the Detroit Metro Airport). Towed by Rolfson driving a 1926 Buick sedan, Laister took off at 35 mph, flew for one minute and landed smoothly. 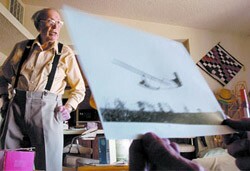 He used that same glider, known as the LA-1, to train fellow members of the glider club at Lawrence Institute of Technology in Southfield, MI. After marrying Helen Yops in 1936, Laister became less involved with the club. One day in 1937, George Lawrence, president of the college, stopped Laister in the hall and asked him to develop another project for the glider club. Working from an earlier design, Laister and two fellow students built a gull-wing sailplane -- the Yankee Doodle. 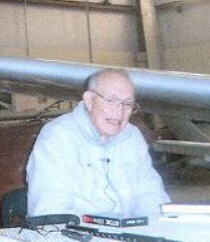 In January 1941, when Laister was working as an engineer at Curtiss-Wright in St. Louis, MO, he met Howard Blossom, a pioneer of soaring. "Howard was a gentleman's gentleman," Laister says. It was also in early 1941, that he heard that the Army Air Corps was planning to have a glider force second to none. "I contacted them and won a contract to build a two-place training glider developed from the Yankee Doodle," Laister says. Laister had no company, but John Kauffman, a St. Louis stockbroker, raised $10,000 - enough to jump-start the Laister-Kauffman Aircraft Corp. Laister was president and CEO; Kauffman was treasurer; Murray Whitehead was in charge of industrial relations; Howard Blossom was quality control manager. Some of the trainers they built are still being used: for example, at the Sao Paulo Soaring Club in Brazil. What's even more remarkable, Laister-Kauffman delivered its trainer to the military five days ahead of schedule, an unheard-of feat. After the aircraft's successful static test, at Wright Field in Ohio, Col. Fred Dent called Laister into his office. "When Fred asked me to put the English Horsa glider into production," Laister says, " I said, 'We can do better than that.' Fred always smoked a stinking, black cigar. He said, 'You think you're so smart? Let's see what you can do.' By the time I got back to St. Louis, I had the plans in my head. Three days later I showed them to Fred." A contract was signed in the spring of 1942. Laister had similar dedication to the sport of soaring. Among his noteworthy contributions is the Laister LP-15 Nugget. He first used the technique he developed for bonding wing skins in the Nugget. In 1975 the Nugget won the USA National Standard Class/15-Meter Competition. Jack Laister received the Exceptional Achievement Award in 1975 and gave the Barnaby Lecture in 1985. More information on Jack Laister's life and accomplishments can be found in an article by Sylvia Colton in Soaring magazine, July 1966, page 10.